From the glass bottom boat you will get an up-close view of the beautiful coral reefs surrounding the island of Bermuda. 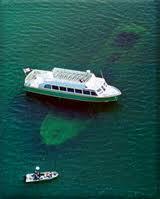 With a shallow draft you can float over the surface of the delicate living coral reefs teeming with life. There will be colorful fish, turtles and many more marine animals. Relax as your Captain relates little know facts and insights about Bermuda's marine life, history and people. You'll cruise to the pristine waters surrounded by miles of the world's northenmost coral reef, and stop at the Shipwreck of the 'Vixen,' a scuttled ship rich in history, with a back-story too hilarious to believe. Departing the reef the boat will pause at the nearby sea grass beds, where you may spot a few of the many transient turtles that take refuge in this Mid-Atlantic sanctuary. Then sit back and relax and enjoy the ride home. Children,under three (3) years of age who do not require a seat are free. Children, twelve (12)years of age and under, require a child's ticket.